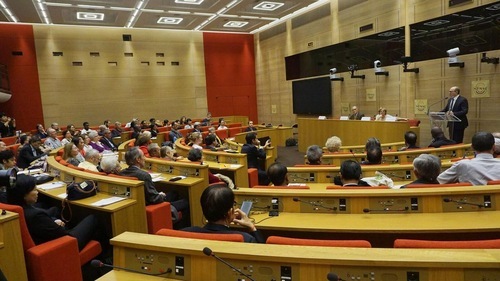 A presentation on forced organ harvesting captured the attention of French lawmakers during a forum marking the 70th Anniversary of the Universal Declaration of Human Rights, which was held in the French Senate on November 16. Senator André Gattolin sponsored the forum with the association Act for Human Rights. Speakers included Human Rights Ambassador François Croquette, who is with the French Department of Foreign Affairs, and representatives from many organizations. Dr. Alexis Gennin, a neuroscientist and the science consultant for the non-governmental organisation Doctors Against Forced Organ Harvesting (DAFOH), talked about the methods investigators used to collect evidence to verify forced organ harvesting in China. According to Dr. Gennin, large-scale organ harvesting from Falun Gong practitioners, Christians, and Tibetans has been confirmed by multiple independent international investigations. 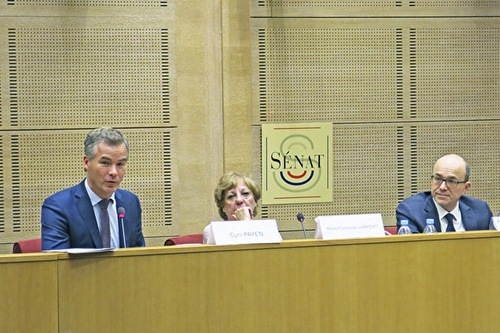 Alexis Gennin (left); Marie-Françoise Lamperti (middle), the president of Act for Human Rights; and Senator André Gattolin (right). He said that in the 1990s, only 300 to 600 organ transplant surgeries were carried out in China. After the persecution of Falun Gong was launched in 1999, however, 3,000 such surgeries were done in 2000. That number reached 10,000 in 2001 and 30,000 in 2006. But after the wife of a surgeon involved in organ harvesting testified in 2007 about the crimes her husband committed, the Chinese government deleted data on organ transplant surgeries. 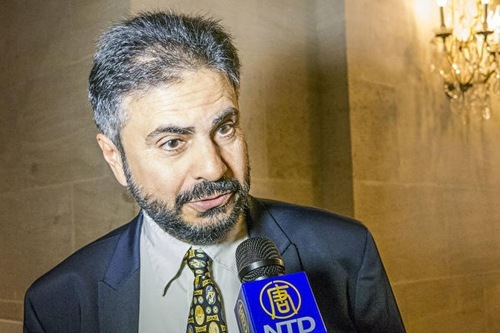 Dr. Gennin talked about the investigation carried out by two prominent Canadians, human rights lawyer David Matas and former member of parliament David Kilgour. They discovered that the waiting time for an organ in China is around three weeks, which is much less than in countries with regulated organ donation systems. China does not have such a system, and several Chinese hospitals have admitted to investigators that their organs came from Falun Gong practitioners. China claims that the organs come from executed death-row prisoners, but Dr. Gennin stated that the number of prisoners executed in China does not match the number of transplant surgeries. He believes that France should not remain silent because, for the last two decades, many Chinese organ transplant surgeons have been trained in France. He pointed out that in France, people wait 3 to 5 years for an organ. However, every year 300 patients are withdrawn from the waiting list. They did not have transplant surgery in France, nor have they passed away. He said it is necessary to discuss changing the laws to prevent French citizens from traveling to China and unknowingly participating in this crime. After Dr. Gennin spoke, Senator André Gattolin asserted that forced organ harvesting in China is genocide. He said that parliaments in many countries, including France and Italy, are concerned about the issue. 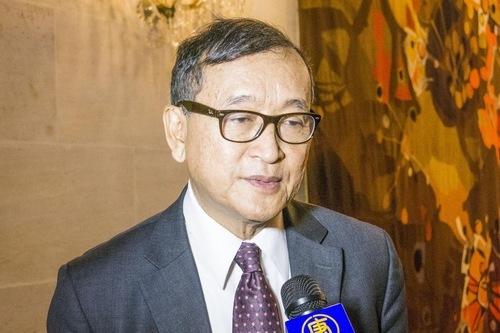 He said that lawmakers should help by writing laws to make sure citizens do not get involved in the illegal organ transplant trade in China. 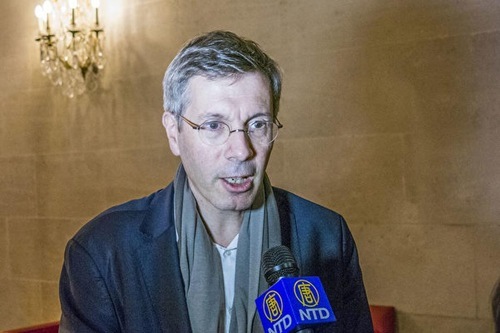 When asked about the persecution of Falun Gong, Mr. Croquette said that France has raised the issue with China many times in hopes that the Chinese government would respect freedom of belief, including Falun Gong. He said that France is not the only country that has tried to discuss the persecution with China; many other countries have done the same, which is very significant. 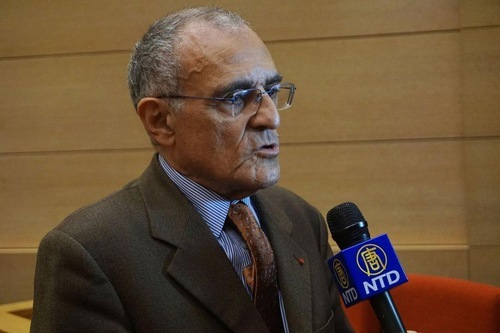 Judge Jean-François Zmirou talked about Falun Gong practitioners’ lawsuits against former Chinese Communist Party leader Jiang Zemin, who launched the persecution of Falun Gong. He said that the lawsuits show that people want to do something to stop the persecution. He added that the lawsuits can also be filed in France. Guy Aurenche, who is with Christians Acting to Abolish Torture (ACAT, Action des Chrétiens pour l’Abolition de la Torture) suggested three ways to help religious groups being persecuted in China: Learn about the existence of these groups, clarify the facts to politicians so that they will take action to help, and demand that the Chinese government sign the pertinent laws and treaties. “We should tell the Chinese government to uphold the laws they signed,” he said.